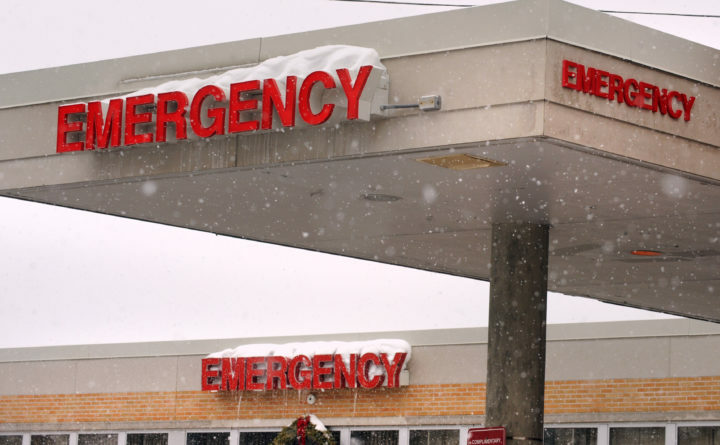 The Emergency Department entrance at St. Joseph Hospital in Bangor. For the first time in decades, Bangor-based St. Joseph Healthcare is planning a multimillion-dollar investment in its facilities and its future, both within the hospital’s inpatient areas and at its outpatient campus at 900 Broadway. Changes include a new urgent care clinic, new outpatient laboratory and medical imaging centers and updates and improvements to inpatient rooms at St. Joseph Hospital. St. Joseph Healthcare, which has served the Bangor area since the 1940s, is a member of Covenant Health, a nonprofit Catholic health care organization based in Massachusetts. Covenant also owns St. Mary’s Health System in Lewiston and manages several long-term care facilities in Maine. Mary Prybylo, president and CEO of St. Joseph Healthcare since 2011, said the organization is positioning itself to serve the Bangor area into the future. “The time is now to prepare ourselves to fulfill the role we envision,” she said. That vision includes a strong emphasis on primary care in collaboration and partnership with other health care providers in the region, she said, including Bangor’s much larger hospital, Eastern Maine Medical Center. While EMMC provides important specialty care, including advanced trauma care, labor and delivery services and neonatal intensive care, St. Joe’s will deepen its commitment to providing “general medical care, particularly for elders,” Prybylo said. “We don’t see that we’re duplicative in any way [with EMMC],” she said. A capital campaign launched in 2016 has already garnered about $3 million, during its more targeted “quiet” stage for major gifts, which amounts to a little less than half of the overall fundraising goal of $7 million. The campaign is expanding its reach and seeking support from the broader community. With an estimated total price tag of about $15 million, the project will require additional financing, as well. Covenant Health Senior Vice President Brad Coffey, a longtime resident of the Bangor area, said that, over time, St. Joe’s has invested in medical technology and qualified staff to maintain its reputation for clinical excellence and compassionate care. Aesthetics and amenities, however, have not always been a top priority. The hospital comparison section of the Medicare.gov website grades U.S. hospitals on many elements, including facilities, clinical performance and patient satisfaction. Out of five possible overall “quality stars,” it awards St. Joseph three stars and EMMC two stars, with St. Joseph consistently ranking higher on patient experience surveys, according to the most recent data. Still, he said, the facilities are overdue for an upgrade, including tired-looking inpatient hospital rooms as well as the somewhat industrial-feeling outpatient complex at 900 Broadway. The first changes are slated to take place at the outer Broadway campus during 2019, with the addition of an urgent care center for St. Joseph Healthcare patients already enrolled at one of the organization’s several outpatient primary care or specialty care practices. Coffey said this same-day clinic will not only ensure that patients are seen promptly but also permit St. Joe’s other outpatient practices to hold fewer unscheduled slots during their busy work days. Other changes at 900 Broadway will include upgrades to existing physical and occupational therapy facilities and the St. Joseph Regional Breast Care Center. The exterior also will be updated to make it more appealing and navigable. St. Joseph Hospital is licensed for 112 beds but typically serves about 80 patients, since most rooms have been used as private rooms for several years. Coffey said patient rooms are way past due for improvements, with the last significant renovations taking place in 1962. Plans are still evolving for this phase of the project, but rooms will likely be made larger, in order to accommodate patient care technologies as well as family members who wish to stay overnight with loved ones. Improvements will be made in managing sound and light in patient rooms, and bathrooms will be updated. For more information on the planned changes at St. Joseph Healthcare, visit www.stjoeshealing.org/campaign or call 907-3166.